Ikuyo Yoshimura, the university retired professor, was born in Kyoto, Japan in 1944. Poet, translator and researcher on R.H. Blyth and the world haiku. Graduated from Doshisha University (Kyoto) and gained M.A & Ph.D. at Aichigakuin University (Nagoya). She began to write poems in college years and studied haiku under Kaneko Tohta (founder of the haiku group "Kaitei"). 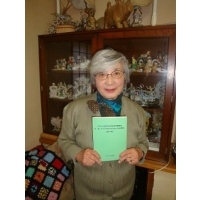 Founder of the writing English haiku group Evergreen (1987); in 2010-2012 president of The Poetry Society of Japan. Coterie member of Kaigen (formerly Kaitei) Haiku. Editor and permanent contributor of SENRYU TO, contributor to Kaigen Haiku, Modern Haiku, and Simply Haiku magazines. Awards and Other Honors: Awarded: Four Season Haiku prize by Newsweek (1990); Nagoya Mayor's Prize on haiku anthology, At the Riverside (1990); Poetry Australia & Melbourne Poetry Society (1991); First prize winner of the 2003 HPNC rengay contest (with Michael D. Welch);  Sasanqua Prize for The Life of R.H.Blyth by Sasanqua Club of Gakushuin University (2008); The First U.S. - Kagoshima Spring Haiku Contest (2014); A Year Prize on The Study of The Achievement Reginald Horace Blyth, English-born Japanese Literature Scholar by Historical Society of English Studies in Japan (2017). Books Published: Poems: Small Pictures (Bunwa- Do 1966); Linked Poems by College Students (Ogaki Women's College 1955); Poems of War and Peace (Chikurinkan 2007); Drops of the Setting Sun (Coal Sack 2009). Academic publications: The Life of R.H.Blyth (Dohosha 1996); Internationalization of Japanese Poems (Chugai Nippo 2002); An Introduction to English Haiku for Japanese (The Japan Times 2003); Commentary & Book review of The Shape of Love by Yukiko Inoue Smith (Union Press 2016); The Study of The Achievement Reginald Horace Blyth, English-born Japanese Literature Scholar (Ringo-Ya Bunko 2017). Credits: "spring mist" - Cats in Love, Rainbow Press 2000; "an elderly couple" - A Desert Rose, Rainbow Press 2002; "his coming" - A Halo Round the Moon, Rainbow Press 2004; "no one knows" - elephant's eyes, Rainbow Press 2007; "rainy cottage" - Love Haiku, Common Ground.com 2010; "cicada shell" - TRIO: window, JUNPA 2018.